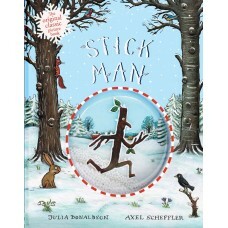 Since its publication in September 2008, the story of Stick Man's courageous journey back to his family tree has captured the imagination of hundreds of thousands of children. Now the original classic picture book STICK MAN (9781407108827) is available in a beautiful new gift edition, with a fun and festive snow dome embedded in the front cover. This innovative new format contains no liquid, making it suitable for children.